The Sanskrit word ‘Satsang’ means “Meeting with Truth”. This is the heart of Tyohar’s work and the essence of the journey in Pacha Mama. Living closely and sitting silently in the presence of a living Master can nourish the deepest longing of the soul. 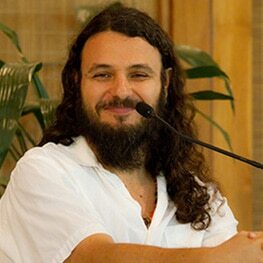 In Satsang, Tyohar exposes the workings of the mind while pointing to that which is beyond the mind. He responds to questions and guides the gathering to a silent space within. The Satsang always starts with the ‘Namaste greeting’, which means: “The Buddha in me recognizes and bows down to the Buddha in you”. Satsangs happen in Pacha Mama spontaneously throughout the year, and are an integral part of the Silent Retreats. then you will relax into yourself. This is a trick of postponing. and will go through expansion. and you are climbing a mountain that has no peak. You can keep climbing for the rest of your life. of letting go of trying to be someone that you are not.